CHIS, R. , VINTAN, L.
This paper presents the analysis and multiobjective optimization of a magnetic actuator. By varying just 8 parameters of the magnetic actuators model the design space grows to more than 6 million configurations. Much more, the 8 objectives that must be optimized are conflicting and generate a huge objectives space, too. To cope with this complexity, we use advanced heuristic methods for Automatic Design Space Exploration. FADSE tool is one Automatic Design Space Exploration framework including different state of the art multi-objective meta-heuristics for solving NP-hard problems, which we used for the analysis and optimization of the COMSOL and MATLAB model of the magnetic actuator. We show that using a state of the art genetic multi-objective algorithm, response surface modelling methods and some machine learning techniques, the timing complexity of the design space exploration can be reduced, while still taking into consideration objective constraints so that various Pareto optimal configurations can be found. Using our developed approach, we were able to decrease the simulation time by at least a factor of 10, compared to a run that does all the simulations, while keeping prediction errors to around 1%. 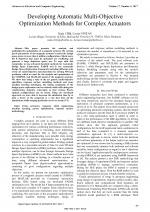 R. Jahr, H. Calborean, L. Vintan, and T. Ungerer, "Boosting Design Space Explorations with Existing or Automatically Learned Knowledge," in Measurement, Modelling, and Evaluation of Computing Systems and Dependability and Fault Tolerance, 2012, pp. 221-235. 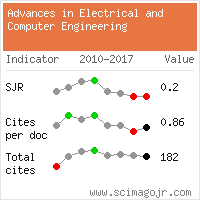 Citations for references updated on 2019-04-18 17:21 in 47 seconds. Website conception, design and maintenance by Eugen COCA. Content updated on 28 Feb 2019. Site engine updated on 28 Feb 2019. This page was generated on the server in 0.070 seconds and loaded in your browser in > seconds.